Does your child continually seek approval and acceptance from others? Does he doubt his abilities when you know he offers so much potential? Does your child bend to peer pressure, rather than express her feelings and stand up for what she believes in? How do you feel when you see so much promise in your child, yet she lacks the inner motivation to succeed? Aren’t you tired of feeling that something that you’ve said or done, or not said or done has damaged the self-esteem of your child? Wouldn’t you like to know your role in the development of your child’s self-image so that you could do something about it? Read the success stories, get the full program details, and order your home study program here. The “Powerful Girl Within” Program is a unique 5 session program that will help you to dramatically improve your daughter’s confidence, self-acceptance, and self-worth. If you want to learn powerful ways to help your daughter feel confident in her own skin, attract friends who love her for who she is, and provide her with tools to help her work through struggles with peers, the Powerful Girl Within Program is the program that can help. Here’s the reality: The situation isn’t going to change by itself. The Powerful Girl Within Program will give you the steps, strategies, tools, and knowledge to support your daughter in creating greater self-confidence, less reliance on what others think, more loving and supportive friendships, and the freedom to be all she is meant to be! Get the full program details here. Are looking for experts who have the answers to all of your questions about how to raise children to feel a sense of confidence, self-worth, resilience, and peace with who they are? 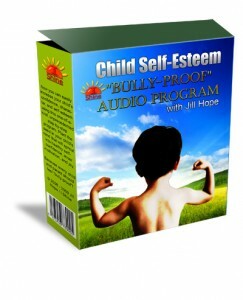 If so, the Enlightened Parents, Empowered Kids CD Series is for you! In this program you will receive powerful wisdom along with practical strategies from top experts that will enlighten you in your role as parent, and as a result, help you to nurture empowered kids. Do you do do do for others almost constantly, whether it is for your boss, your kids, your spouse, your ex, your home, but almost never find time to do for yourself? Do you feel stressed, and as a result find yourself less patient with the people in your life that you most care about? Do you feel trapped by responsibilities with seemingly no easy way to get back to feeling like yourself again? Do you ever wish you could have even just a few minutes for some “me” time? Do you think it is selfish to spend time on self-care? Do you see your kids getting stressed out but feel helpless to do anything about it? If you answered “yes” to even just one of these questions, then you are likely in need of some self-care. You see, when you are feeling drained, spent, stressed, whatever you want to call it, you have nothing good to give to anyone. Just like a car that stops running when it is out of gasoline, you don’t function well when you don’t stop and fill up your tank with the goodness that fills your soul. Once you take care of yourself, you are that much more capable of bringing all of you to those that you love and care about. What we do for ourselves has a ripple effect out to everyone we come in contact with, and everyone that they come in contact with, and so on. The good news is this: Not only is self-care beneficial for all those we come into contact with, but the positive effects of just a little bit of self-care are fairly straightforward and simple to achieve. In fact, you can engage in self-care and feel wonderful benefits in as little as 5 minutes! As a result, I’ve created a program that will allow you to greatly enhance your sense of well-being and leave you feeling much more calm, present, and more like your true self once again. And when you engage in activities that help you feel better, you will model for your children how they can do it too! 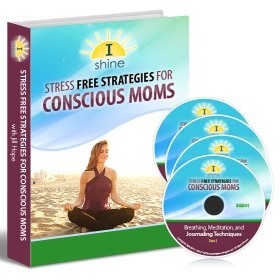 The “Stress Free Strategies for Conscious Moms Program” audio program is a 4-part audio program where you will discover simple, fast stress-reduction techniques, many of which can be done in as little as 5 minutes. Included in the program are several different breathing techniques, guided visualizations, and journaling processes that will take you from stressed to peaceful in no time.